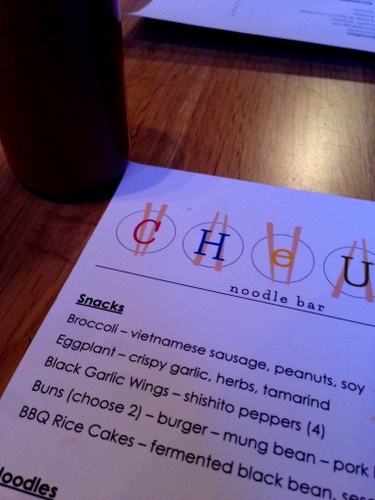 I don’t often end up going to new and cool restaurants right after they open, but it just kinda happened that way with Cheu Noodle Bar. It was a last minute decision that ended up working out. On the Saturday night of their first week, we happened to be in the neighborhood so we thought we’d give it a shot. They said it would be about a 45 minute wait for a 2-top, but it actually ended up 30 minutes. It’s pretty small on the inside, with one long bar, behind which all the cooking is done, and a fairly small number of tables. The menu is also fairly small, which I like! Instead of complimentary bread or peanuts or shrimp chips or whatever, they crush a package of shin ramyun into a bowl so you can snack on the uncooked noodles that are now covered with the flavor packet powder. It’s delicious! 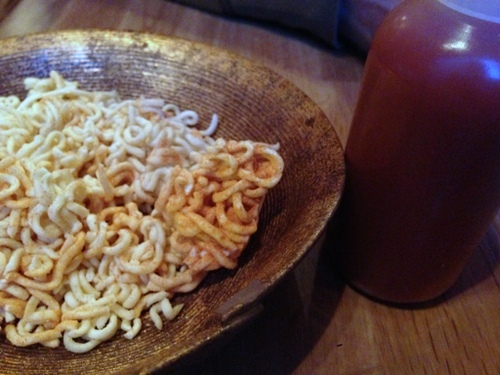 But shin ramyun is spicy, so be careful! That big red piece almost killed me! 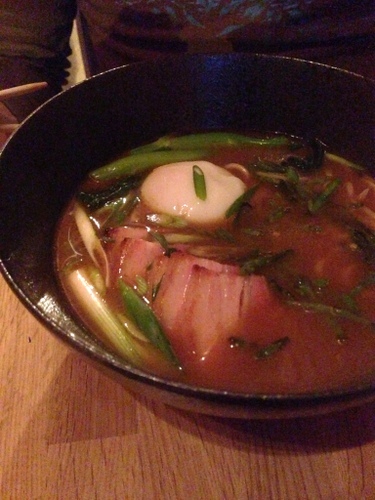 M got the ramen which had a thick and porky broth with hunks of melty pork belly. I got the brisket noodle which came with a giant matzo ball and brussels sprouts in a spicy broth. This was so good! 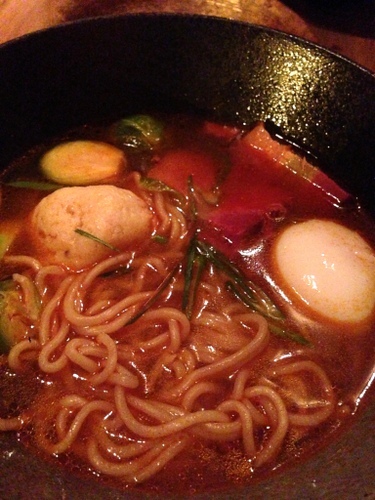 The broth is slightly spicy and a little bit sour, which is right up my alley. There were several thick pieces of brisket and oh boy, the matzo totally filled my belly! Cheu was so much fun. They just added some new items to the menu so we’ll definitely go back! 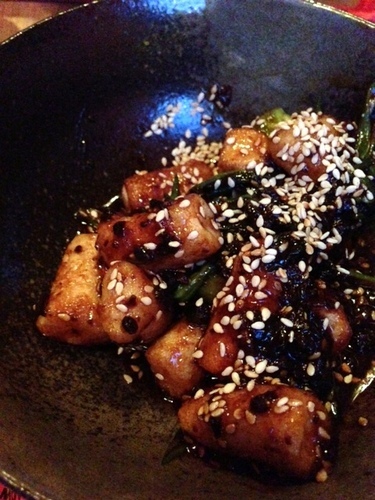 Service was good and friendly and the food came out fairly fast! It looks like this is run by the guys who did the Roundeye Noodle pop-ups last year. yep, it’s the pop-up guys! Looks yummy! Can’t wait to try this place out soon! That was both of those exciting in addition as insightful! Thank you for sharing your feelings with us.